The Future Is In Front Of You Strap in and prepare for the latest in virtual reality. 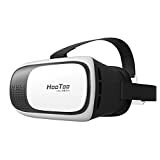 The HooToo HT-VR002 is a virtual reality headset capable of displaying 3D films, stunning 360 degree interactive photos and videos, and dedicated VR websites. 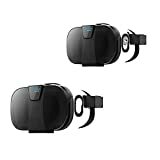 As an entry level headset, it is a fun and affordable way to experience the future of entertainment.Comfort Fitting Wearing the headset feels comfortable and snug on your head due to a balanced design that redistributes the weight to relieve tension, stress, and pressure, ensuring you can use the headset for longer. When worn, the soft sponge casing further reduces pressure as well as providing more room for your face to breathe. 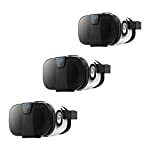 For All Eyes Nearly everyone can use the headset, no matter their level of vision, thanks to a fully adjustable focal (2.1"- 2.9") and object distance settings. When adjusted, the unreal 3D worlds look fresher, crisper, and more detailed than ever before. 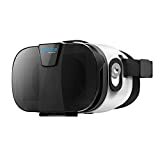 A Wider View Specifically designed for this VR headset, the built-in immersive HooToo Optical Lens prevents distortion while also providing a greater 102° field of vision so you can see and experience more than you ever could in the real world. A Safer, More Immersive Experience For improved usability, the plastic holder provides greater heat dissipation to protect your phone from overheating and damage. When it comes to getting a better view, an insertable 8-shaped shade cover stops light leakage while also optimizing the experience by standardizing framing across different apps. Apps for Everyone Compatible with apps from the Apple App and Google Play Stores, you'll have access to an ever growing library of exciting content from films and games to virtual tours around the world. All popular smartphones with a 4.85"-6.25" width, 2.3"-3.8" length, and 0.29"-0.37" thickness are compatible so everyone can enter a new reality right from their living room.